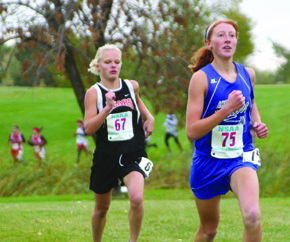 There was plenty of excitement and joy all around Lindsay this past weekend after Holy Family athletes brought home two individual championships, a state title and an additional team runner-up trophy from the 2008 NSAA Cross Country Championships at Kearney. If you think the school and community were excited, imagine the jubilation in the Rich Weeder household! Under Rich’s guidance as Bulldog coach, junior Kevin Weeder and freshman Andrea Weeder swept the Class D individual gold medals – just the second time in history a pair of siblings won cross country state titles in the same season. With the Weeders leading the way, the Holy Family boys dominated the competition to win the Class D state championship and the Lady Bulldogs placed second to two-time defending champion Crofton. The Bulldogs’ big day began with Andrea blitzing the field in the Class D girls race. She sprang to the front early, distanced herself from the pack and paced the field throughout to win in a time of 15:33.2 – well in front of runner-up Dana Kluthe of North Loup/Scotia (15:42.7). “I wasn’t used to starting quite that fast, but I knew at state you have to give it your all,” she commented. Not to be outdone, approximately an hour later, Kevin scored his own impressive win, albeit in different fashion. Sitting around 10th place nearing the mid-race point, Weeder methodically ran down the leaders and pulled away to an eight-second victory with a 17:21 clocking. Another Holy Family sophomore, Breanna Korus, made her own spectacular state meet debut with a fifth-place performance in 16:05.4. “Andrea and Breanna ran gutsy races, competing as freshmen for the first time on the Kearney course,” Coach Weeder praised. “Breanna overcame some giants to place fifth and Andrea ran very determined. Although Weeder was the only Holy Family boy to medal individually, a great team effort garnered the Bulldogs a state championship trophy. Junior Kyle Wegener (17th, 18:00.2), sophomore Robert Plugge (24th, 18:12.4), junior Kelan Schumacher (31st, 18:20.5), soph Jerett Sueper (59th, 18:53) and soph Shawn Korth (73rd, 19:11.1) combined to score 49 points, well in front of runner-up Chase County (81). 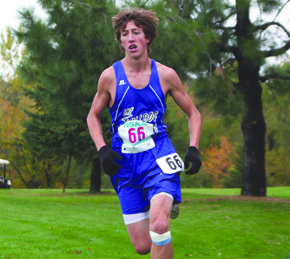 “Kevin was back to form at state, he looked strong and confident,” Rich Weeder stated. Certainly a terrific finish to a great season. The only thing more exciting for these young Holy Family teams and their fans might be dreams of a 2009 encore.